Ellen Heck (born USA, 1983) is a printmaker based in California. 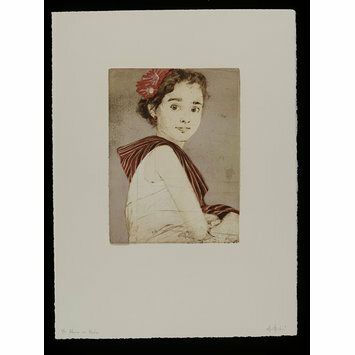 ‘Forty Fridas’ is a series of prints depicting women and girls dressed as the Mexican painter Frida Kahlo (1907-54). On one level, these are intimate personal portraits, but the project as a whole addresses themes of identity, the multiple, individuality, and variation. 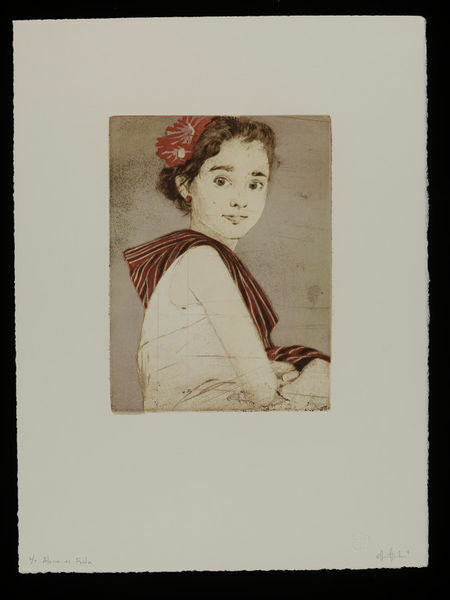 By using printmaking, Heck has highlighted these concepts, which are referenced both in the subject matter and in the medium. The prints are a complex combination of drypoint and colour woodcut, time-consuming and challenging to produce. Each of the prints, made over a period of two years (2011-12), has been produced in a very small edition of between 5 and 10. Each of the prints in this set is number 2 from its respective edition. The suite was selected for the 2014 International Print Biennale and exhibited at Northern Print in Newcastle as part of the Biennale exhibition. Heck was selected by Gill Saunders as the V&A Prize Winner at the Biennale. Colour woodcut and drypoint print, inscribed with edition number, title, signature and date in pencil. Edition number; title; signature; date. All in pencil.